They say desperate times call for desperate measures. After a recent trip to Israel, known as the ‘start-up nation’ – I had to make some innovations of my own. For anyone that has travelled to Israel, you will know that leaving the airport is a small feat. After starting with the inquisitions from airport staff, you also have to jostle with the interrupting and interfering passengers vying for top-spot in every line – it’s a gauntlet and you have really earned a drink by the time you arrive to relative safe haven of the gate lounge. I generally like to travel in the gentleman’s style – leisurely and (as far as my budget allows me) lavishly. It was after 5pm and the flight was delayed for a couple of hours so I thought this was a good time to indulge in a pre-flight aperitif. I looked around the terminal and came to the startling realisation, there is no bar in Terminal 1 of the Tel Aviv airport. You can certainly get a beer at the kosher hotdog stand but there is no wine or sparkling to be found. The savvy wine drinker is never disheartened in such situations and nor should accept temperance as your fait accompli. Being in an international terminal, there was one shining beacon of hope that called out to me – The Duty Free. It was an elegant solution to my problem. 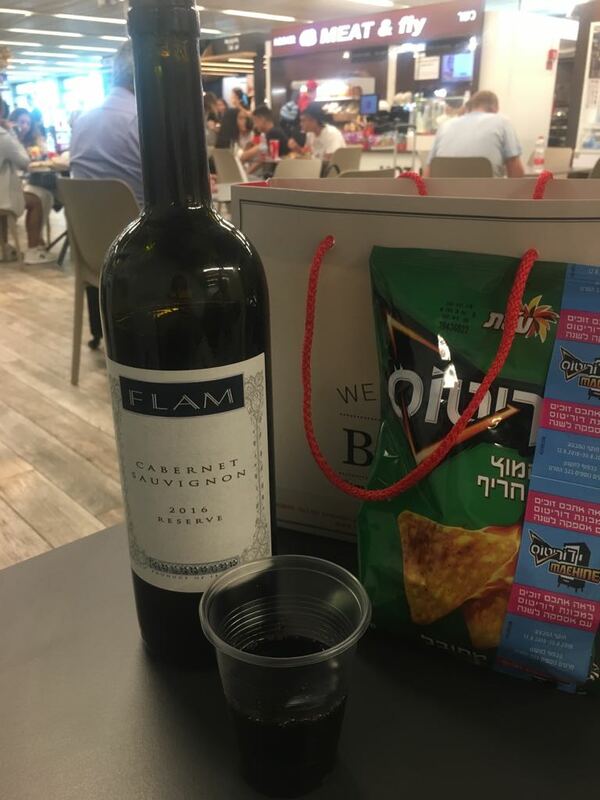 I could simply purchase a bottle of Israel’s finest red to consume alongside my shwarma and doritos in what passed as the food court. (To be fair, the terminal is undergoing renovations). As my eyes scanned the curated collection of Israeli wines, I encountered my second problem… No screwcap wines… No problems, I thought. Surely there would be a touristy airport shop selling memorative bottle openers. Guess again. There were no touristy shops, and I reflected that even if there was, they probably wouldn’t sell a bottle opener given this could provide the buyer access to a small knife and pointy corkscrew – potential weapon a plane! 1. Take the Champagne – well firstly, it wasn’t champagne, it was a demi-sec (semi-sweet) sparkling wine that when chilled might be acceptable but having been under the warming gaze of the bright fluorescent shop lights was going to be questionable at best. 2. There was something with screw-cap called ‘natural, sweet wine’ – it came in an oddly shaped bottle and I really wasn’t going to chance this. Then, like a heavenly apparition, a staff member from the Duty Free asked if I needed any assistance choosing a wine. I explained that I was after a dry red wine with a screw-cap. After establishing that in Israel, they believe that no good wine would ever come under a screwcap (a myth to be dispelled another day), I explained the true reason I was shopping for wine – so I could enjoy a glass of wine while I waited for my flight. She gave a knowing smile and said if I purchased it, she would open the the bottle so I could savour the delicate flavours while waiting in a noisy and crowded terminal. Her recommendation didn’t come cheap and I was flying somewhat blind in terms of what brands were good or not. It seemed to be a choice of cab sav, or cab sav. I took the recommendation of the Flam Cabernet Sauvignon 2016 Reserve at the princely sum of $44.90USD. I justified this to myself that even if there was an airport bar, I would be paying exorbitant prices for a sub-standard wine so I couldn’t afford NOT to buy it. I bought a sandwich and a packet of chips from the aptly named kosher “Meat and Fly” kiosk who also obliged in the provision of flimsy plastic cups to consume the wine. I could now sit back and enjoy my wait at the airport, people watching, nibbling and sipping of my coveted red wine. The key take-away for wine lovers navigating a seemingly ‘dry’ airport - where there is a will, there is a way. This wine spends 14 months in French Oak barrels and is aged in the bottle before release. Definitive blackberry notes, blueberry, violet and a hint of earthiness and vanilla. This wine is full-bodied with a rich velvety palate which I didn’t expect given I was sipping from a plastic cup! It had a long and well balanced finished.